Industry Standards: ASME RTP-1-2007 Reinforced Thermoset Plastic Corrosion-Resistant Equipment is the American Society of Mechanical Engineers' standard for the fabrication of vessels used in corrosive and noncorrosive applications at pressures not exceeding 15 psig. Manufacturers must be ASME RTP-1 certified. 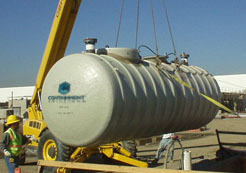 Applications: standby Fire Protection water storage. Industry Standards: Meets NFPA 22 Standard: Water Tanks for Private Fire Protection (2014), AWWA D120 Aboveground Thermosetting Fiberglass-reinforced Tanks for Water and AWWA D121 Bolted Aboveground Thermosetting Fiberglass-reinforced Plastic Panel-Tanks for Water and *UL 1316. Applications: 1,000 to 30,000 gallon Separator systems. Industry Standards: Meets UL Subject 2215, US Coast Guard Test method 46 CFR 162.050, API Bulletin No. 421 & 1630. EPA Test Methods 413.1 & 413.2 and *UL 1316. 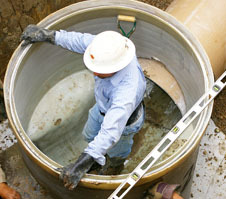 Applications: Agricultural chemicals, Road Treatment chemicals, Irrigation system Collections, Water treatment chemicals, Leachate, Refinery runoff, Airport Deicing (glycol), Medical emergency drain collection, Fire Fighting foam storage, Paint manufacturing, Pickling solutions, Fish hatchery waters, Pharmaceutical manufacturing sumps, Leather processing chemicals. Industry Standards: Complies with UL 1316 standard and material includes a matrix of premium resins, glass fibers and filler that together are compatible with above chemical materials. 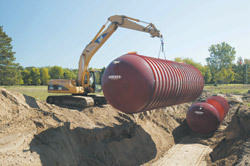 Applications: 1,000 and 1,500 gallon septic systems.